Stars don’t come with labels. When we look up into the sky, we see lots of little points of light. Some might be brighter or dimmer, and a few even have visibly different colors. But they don’t tell us what they are. One of the amazing accomplishments of humanity is that we can look up at the stars and know that they aren’t little lights in the sky. They are suns, seen from very, very far away. Hold your finger up in front of your nose. Look at it with your left eye. Notice what part of the far wall your finger blocks. Now close that eye and open the other. Your finger blocks out another part of the wall. With a little bit of trigonometry, you can find out how much closer your finger is than the back wall. Stars are a lot further away than your finger, but that same idea helped us discover the distance to some of the nearest stars. More distant stars required other methods, including one discovered by an astronomer named Henrietta Swan Leavitt. Leavitt began her astronomy career as a computer, hired to perform boring mathematical calculations in the days before such calculations were automated. Leavitt stuck with it, and became a trusted member of the Harvard College Observatory. Well, trusted may be a bit of an overstatement. As a woman, Leavitt was never allowed to use the observatory telescope. But she was given access to photographic plates, from Harvard and elsewhere. Leavitt noticed something strange on these plates. Most stars looked exactly the same on the plates, night after night after night. But other stars changed their brightness over a period of days or weeks. That wasn’t the exciting discovery. Variable stars had been known for a long time. The exciting part was this: Leavitt noticed that the variable stars in the Large Magellanic Cloud, a cluster of stars visible only from Earth’s Southern Hemisphere, had an interesting relationship. The brighter the star, the longer its period of bright and dark. In fact, the relationship was so strong that Leavitt could turn the data into a straight line graph. Why was that so exciting? The Large Magellanic Cloud was suspected to be very, very far from Earth. Suppose you live in Baltimore and have two friends living in Seattle. Those two friends are just about the same distance from you, even if they live a few miles apart. The same is true of stars in the Large Magellanic Cloud as seen from Earth. They are all so far away that any difference in their distances from us are unimportant. To a good approximation, these stars are all the same distance from us. That means that the bright stars really are bright, the dim stars really dim. This relationship (with a few details omitted) let us humans find the distance not just to stars but to to galaxies containing those stars. Where are we in our tale? We’ve got not just stars, but galaxies, collections of perhaps 100 billion stars or more, whose distances we can know through nothing but our ability to build instruments, make observations, and formulate and then test bold ideas about what’s out there. Time for another down-to-earth phenomenon with cosmic significance. Watch a NASCAR race on television. As the 200 mph billboards fly past, you’ll hear a distinctive sound. The sound starts high, then suddenly switches to a lower pitch as the car goes past you. This is the Doppler effect, the result of sound waves bunched up in front of the approaching car, stretched out by the receding speeder. An analogous effect occurs with light. Instead of pitch, the change is in color. As objects move away from us, the light they emit is shifted toward red. As they move toward us, light is shifted toward blue. In 1929, Edwin Hubble (and as it turns out two years earlier Georges Lemaître) discovered an odd relationship. Almost every observable galaxy wasredshifted; the were almost all rushing away from us. Not only that, but the further away the galaxy, the faster it was receding. It was soon realized that this could be explained not by postulating our galaxy as the center of the universe, but instead by seeing that the view would be just the same from any galaxy if space itself were expanding. In that case, sort of a raisin bread view of the universe, all the galaxies would be raisins and space would be the expanding bread. From any raisin, it looks as if all the other raisins are running away. Further, if we run the tape backward, we see that the universe as not expanding into the future, but contracting into the past. There must have been, in this scenario, a time when the universe was incredibly small, incredibly dense, and incredibly hot. 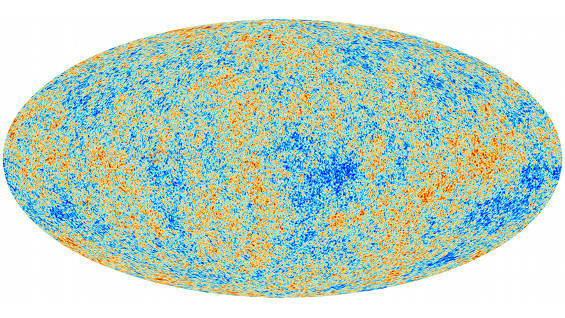 George Gamow and many others realized that such a small, dense, hot universe would have left behind a fossil. In 1965 two scientists named Arno Penzias and Robert Wilson accidentally discovered this fossil. It was an invisible kind of light, so stretched out over time and space that it was now in the microwave region of the spectrum. (Penzias and Wilson at first mistook this radiation as a residue reflection caused by pigeon poop in their radio antenna.) This radiation formed less than a million years after the Big Bang, at the moment when the universe had expanded and cooled just enough to let the first atoms form. Why then? Because before the formation of atoms, the universe was filled with a sea of charged particles such as electrons and protons. These charged particles absorb light, so that when they were freely roaming space no bit of light could last long before being absorbed. When protons and electrons formed atoms, the light could for the first time roam free. When it first formed, the background radiation was at a temperature of around 4000 Kelvin (where 0 Kelvin is absolute zero and 273 Kelvin is the freezing point of water). Today, this background radiation is so stretched out it gives empty space a temperature everywhere of around 3 Kelvin, extremely cold but not absolute zero. released the finest-ever picture of the “bumpiness” in that radiation. So what does it mean? It means, for one, that our best theories about the beginning of the universe are doing remarkably well when they might have failed. This is an enormous accomplishment. First of all, scientists accomplished something wonderful by creating theories that could fail. Secondly, when given the chance to fail, the theories held up. They made predictions about reality, and those predictions were borne out by observations, some of which were released today. 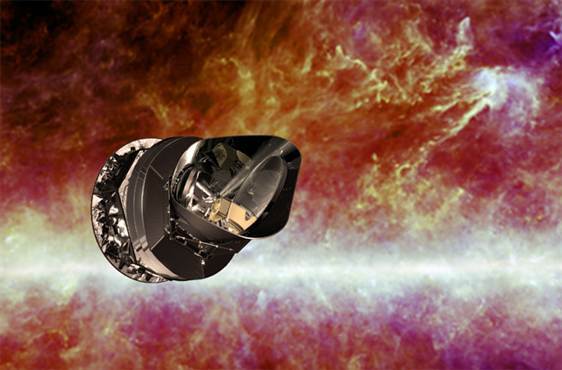 The Big Bang, as envisioned by modern cosmology, really did happen. The picture at the beginning of this (already very long) blog entry is the best evidence yet. This is a triumph of human creativity. But though we should celebrate our accomplishments today, we should also look ahead. Not every detail of Planck’s fantastic photograph can be explained by our best current theories. There are interesting patches in this image, strange irregularities, and no one yet knows what they mean. They might signal new physics. They might give us our first evidence for parallel universes. They might give us details about not just how the Big Bang happened, but why it occurred in the first place. In other words, the details of this image might bring us closer to ultimate question: How did we get here? And where is “here” anyway? The best discoveries answer some questions, but raise even bigger ones. Today’s discovery is a fine example. Now reach out and put your hand on the screen. Around one out of every one hundred of those little bursts impacting your hand is caused by a bit of light left over from the Big Bang. When you touch that screen, you are touching the Big Bang itself. We humans are creators. We created the knowledge that today lets us not only touch the Big Bang, but more importantly know what it is we are touching.